Zara and Kabir's life has taken new twist as Zara is scared seeing how Elina is getting closer to Amir. Elina is falling in love with Amir and Zara very well knows that Kabir is totally against love marriage. Zara is trying to turn situation better but here Zeenat will spill water over her. 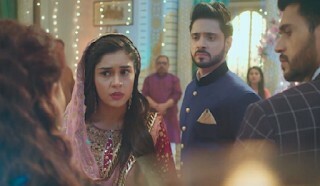 Zeenat will make Kabir reach Elina where she was in hospital with Amir and Kabir is shocked to see Elina there. Elina is shocked to see Kabir their as well while Zeenat is happy to see this and her plan gets successful.